Welcome to the four hundred and fifty-first of my blog interviews with novelists, poets, short story authors, biographers, agents, publishers and more. Today’s is with novelist and short story author Jenny Worstall. A list of interviewees (blogged and scheduled) can be found here. If you like what you read, please do go and investigate further. Morgen: Hello, Jenny. Please tell us something about yourself. Jenny: Hello! My name is Jenny Worstall and I am based in London. Thank you so much for interviewing me. Morgen: You’re so welcome. 🙂 How did you come to be a writer? Jenny: I have always been interested in writing and I have scraps of paper with stories and character sketches dating back to childhood but somehow never found the time to take it further as I was so busy with music. The chance to write came when I gave up full time work after the birth of my son. I wrote a lot of short stories during this time. By the time my daughter was born there was no extended time to write again – just a few snatched notes while feeding her. When my daughter started at nursery, I remember running all the way home after dropping her off (first exercise for years) and writing furiously all morning until I picked her up at midday. That was the real beginning of my novel “Make a Joyful Noise”. Morgen: A lovely title. 🙂 In the introduction, I’ve described you as a novelist and short story author, what have you had published to-date? 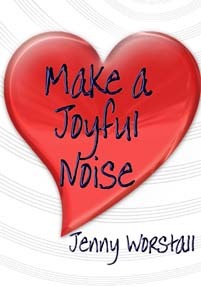 Jenny: I published my first novel “Make a Joyful Noise” as an ebook on amazon in February this year. (UK link and USA link). A month later I published a collection of 3 short stories, “Lemon and Lace”, (UK link or USA link) and these have now been followed by two further collections, Infant Barbarian (UK link or USA link) and Jubilee Violin (UK link or USA link). Morgen: Wow, you’d don’t hang around. 🙂 You’re self-published, what lead to you going your own way? Jenny: I tried the traditional route and have a large and depressing collection of rejection letters to prove it (plus a story accepted for The People’s Friend – thank you!). Earlier this year I read an article in Woman and Home about self-publishing an ebook on amazon. I thought I knew all about self-publishing or “vanity publishing” as it used to be called. I had attended a creative writing course when my son was 6 months old and we had been warned that self-publishing was an easy way to be exploited and pay out a lot of money for little return. However, you pay nothing to publish on amazon and this “nothing” element was very important as by now my children were teenagers with an ability to consume our salaries that we could only have dreamed of when they were babies. My long-suffering and technologically-minded husband did all the fiddly stuff on the computer for me and my kids (now 17 and 13) helped to design the cover of my first book and said they were proud of me (well, my daughter said it once). Morgen: I’m sure they are. 🙂 Congratulations on the People’s Friend acceptance, by the way, I’m yet to score that goal!.. although submitting more than once a year would help. 🙂 What are you working on at the moment / next? Jenny: I am working on another collection of short stories. Morgen: Yay, I love short stories and write one a day for my 5pm Fiction slot. Do you manage to write every day? Do you ever suffer from writer’s block? Jenny: I have never suffered from writer’s block as I am always busy with musical and family activities. As soon as I find a few minutes, I write and write as I know someone will soon tell me they are hungry. When my children were small I always had paper and pen about me rather than using the laptop, as I found they would tolerate “Mummy’s Scribbles” but got upset if they saw me using the computer as I was always telling them not to spend too much time on it! Morgen: Maybe that’s the way to go… stick with the ‘scribbles’ (or let them fend for themselves?). 🙂 Do you plot your stories or do you just get an idea and run with it? Jenny: I plot my stories but find the characters often surprise me and take over. Jenny: I keep notebooks full of observations about characters and situations I observe in my daily life. I have found that the world of music is full of the most amazing characters (and egos!) and this is a very rich source of inspiration, as is the world of teaching. Morgen: I have a couple of teacher friends with many stories to tell… they’ve both left the profession so can divulge away. 🙂 What advice would you give aspiring writers? Jenny: I would tell people to write something, even if you only have three minutes to spare. This is the same advice I give to my piano pupils – make the most of your time and get on with it! Morgen: Absolutely, 300 words a day is a 100,000-word novel in a year. Where can we find out about you and your writing? Jenny: I have a website and an Author Page on Amazon. Morgen: Thank you very much, Jenny. At that very moment, Tristan was lying full length on Miss Custard Cream’s sofa. Miss Custard Cream, more properly known as Claire, had managed to persuade Tristan to allow her to cook him a vast Sunday lunch and now she was washing up while he told her all about his childhood. As Claire ran her fingers through Tristan’s thinning locks, she wondered why she felt so fed up. She had been trying to get Tristan round to her flat for weeks, had worked very hard at it, in fact. Lunch had been rather disappointing as most of Tristan’s conversation had been about himself or sly digs at the lack of talent shown by other musicians, particularly Miss Greymitt, the choir pianist. The attractive soprano who had sung with them at their summer concert had come in for a great deal of bitchy comments from Tristan. “Nothing but resonance between her ears,” Tristan had remarked scornfully. Claire had tried in vain to interest Tristan in her life and concerns but he had shown no inclination to discuss her job as a legal secretary or her ambition to become an aromatherapist, beyond making one or two crude jokes about towels slipping and asking her if she would give him a full body massage after lunch. Update December 2012: My novel, Make a Joyful Noise, is now in paperback and available from all Amazon sites (and reduced 10% by Amazon too!). I have started a blog which can be accessed through my web site: http://www.jennyworstall.webspace.virginmedia.com or from this link: http://jennyworstall.wordpress.com. I have an Advent Calendar of Christmas Music on my blog at the moment. Happy Christmas! Thanks so much for this interview, I was attracted to Jenny’s “Infant Barbarian”, and when I discovered Jenny had written a full length novel, I downloaded it immediately onto my kindle. Jenny’s books are pure joy to read – carefully observed characters that make me smile & think ‘I know someone like that’ – True to life people, dealing with real dilemmas, with just the right amount of spice, all combine to make a relaxing, entertaining read.